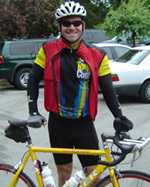 On a cool Sunday morning, three Insulin Factor members rode their bikes in the Santa Cruz Tour de Cure to raise money for the American Diabetes Association. 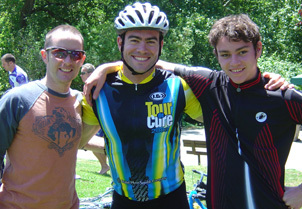 Joseph Zalla (left) and Matt Vogel (center) cycled the hilly 62 mile road course through the Santa Cruz mountains, Watsonville strawberry fields, and along the Pacific coastline. Throughout most of the ride, Zalla, Vogel, and others rode single file in a nice draft line, averaging speeds of 27 mph. Meanwhile, Chris Schaefer (right) rode the 15 mile out-and-back mountain bike course. Schaefer powered through the 7.5 mile uphill section, cruised down another 5 miles, and finished off with some nice singletrack. After the ride, Insulin Factor members enjoyed lunch and relaxed at Aptos Park. Together, the Insulin Factor team raised over $4,000 for the American Diabetes Association.